Background: Imidazoles are important class of heterocyclic compounds showing biological activities. Several methods have been investigated till today for the synthesis of triaryl imidazoles. Some of these classical as well as nonclassical methods experiences drawbacks for instance elongated reaction time, expensive catalyst, low yield of product etc. Hence improvement of a competent method is still necessary. 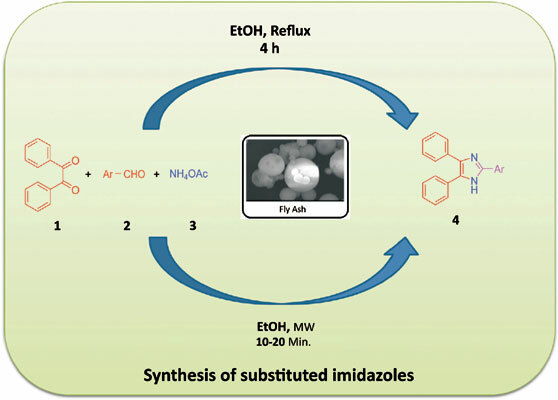 This paper reveals greener protocol for the synthesis of triaryl imidazoles by cyclocondensation of aromatic aldehydes, benzil and ammonium acetate in existence of fly ash as an efficient heterogeneous catalyst by means of microwaves. Methods: Heterogeneous catalyst fly ash was prepared by simple thermal activation method. The catalyst was systematically characterized through wet chemical analysis, XRD, FT-IR, SEM and EDS. The structural analysis was done using XRD and IR. Morphological study was performed using SEM and elemental composition studied by EDS technique. This activated fly ash catalyst was applied in the synthesis of trisubstituted imidazoles. The progress of reaction was checked by TLC and the synthesized compounds were further confirmed by FT-IR, 1H-NMR and 13C-NMR spectroscopy. Results: To check feasibility of activated fly ash for trisubstituted imidazole synthesis, reactions under microwave irradiation employed. The products were obtained in higher yield (92-98%). Conclusion: The fly ash was found to be highly effective in the synthesis of trisubstituted imidazoles under microwave irradiation. The significant features of this protocol are rate enhancement, uncomplicated work up process, high yields and employ of ecofriendly catalyst. Wet chemical analysis, microwave, fly ash, heterogeneous, catalyst, imidazole.